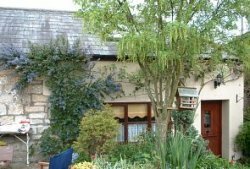 Laburnum Cottage is situated in the couryard to the rear of Devonshire House, a discreet bed and breakfast establishment. With its own patio, seating area for 4, small pond and waterfall. 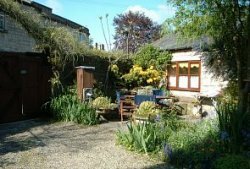 The cottage has a quaint yet charming atmosphere, providing a welcome oasis from the hustle and bustle of the World Heritage City of Bath. Only a 15 minutes pleasant walk into the wonderful city of Bath, with its many tourist haunts and historic past. 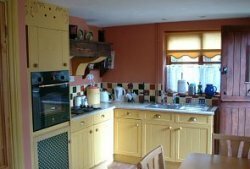 The cottage itself is entered through a stable door directly into a fully fitted kitchen with dining area for 4. A short hall leads to the open plan lounge with sofa bed, TV, video and cd player. A shower room is situated off the hall. 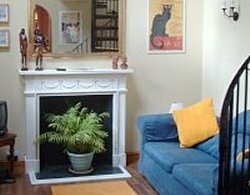 A romantic double bedroom is reached via a spiral staircase, with the roof windows creating a light and airy space, a wc and walk in wardrobe are on this mezzanine level. Free parking is on street or secure parking is available within the courtyard. Balance to be paid - 4 weeks in advance to arrival.